One of our housemates, Durango Blue, likes being read to. If you need to mix up your bedtime story routine a little bit, the Global Space Education Foundation has just the thing for you: Story Time in Space. It’s exactly what it sounds like — astronauts on various missions in space read popular children’s books while floating about, and the videos are edited and shared with kids way down on Earth. The results are adorable as well as educational and inspiring. Check out astronaut Kathleen Rubins reading Rosie Revere, Engineer by Andrea Beaty and try not to get choked up at how amazing this all is. The concept was developed by Patricia Tribe, the former director of education at Space Center Houston, and Alvin Drew, the first NASA astronaut to read a story in space for the program, during the final mission of the space shuttle Discovery. The pair were looking to find a way to encourage reading among kids while also promoting STEM education, and landed on the idea of having on-duty astronauts reading science-based kids’ books, gravity-free. Since the initial reading, all of the story times have taken place on the International Space Station, as it hurtles through nothingness at 17,500 miles per hour around the planet. It’s only a guess, but this may be slightly more interesting than your kids listening to you feign excitement while reading The Mitten again. Astronaut @Tim Peake tweeted from the ISS about his reading of The Incredible Intergalactic Journey Home by Lost My Name book that he has read for us! check out the pic!!! So excited! Not only are does Story Time in Space aim to make reading out of this world, it also stresses the importance of diversity. Tribe and her team select books for a wide range of reading levels (though all can be read in 15 minutes or less) and from a wide range of STEM topics, from physics to engineering to biology. The group also selects a diverse set of astronauts to read the books, so that kids can see that people who look just like them can reach for the next frontier. For example, Japanese engineer and JAXA astronaut Koichi Wakata read Max Goes to the International Space Station in Japanese for the program this summer. The Story Time from Space program is also expanding. The group is working on adding a set of nine simple science experiments for kids that were conducted from the space station, involving concepts like energy transfer and surface tension. In addition, more books are on the way, including A Moon of My Own by Jennifer Rustgi, The Rhino Who Swallowed A Storm by LeVar Burton and Susan Schaefer Bernardo, and Moustronaut by Astronaut Mark Kelly. While those projects are being completed, Earthlings can enjoy the rest of the collection, which includes Max Goes to Mars, by Jeffrey Bennet, as read by astronaut Mike Hopkins. Let’s just hope that these awesome videos don’t ruin regular books read in gravity, from the ground, by plain old mom who probably isn’t even an astronaut. April 12 is DEAR day: Drop Everything And Read day! 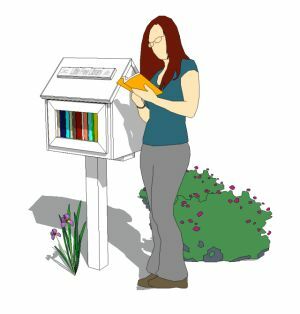 What is Drop Everything And Read? “April 12 has been proclaimed National “Drop Everything and Read” (D.E.A.R.) Day. It is an initiative to encourage families to designate at least 30 minutes to put aside all distractions and enjoy books together…to make it a special time to “drop everything and read.” The birthday of Newbery Medal-winning author Beverly Cleary is the official national D.E.A.R. day, and Cleary’s most popular book character, Ramona Quimby, is the program’s official spokesperson. Happy birthday to an Oregon author – Beverly Cleary! Seventeenth Century Prose and Poetry, selected and edited by Witherspoon and Warnke – I think this is the only college textbook I still own. Turns out, I’m rather fond of some of the metaphysical and cavalier poets of 17th century England. One of my absolute favorite poets is Robert Herrick (up there with Edward Lear, Ogden Nash, Shel Silverstein & Emily Dickinson). In addition to these lovely poems, you might also check out this rather smutty one. How to Be a Better Foodie: A Bulging Little Book for the Truly Epicurious, by Sudi Pigott – It’s kind of fun in a surface-of-the-topic way. Lots of little info and details about different foods, cuisines, food traditions and more. Not terribly helpful on the How To part unless you’re absolutely brand-new to the idea of being a Foodie. Sweet Shoes for Wee Ones, by Kristi Simpson for Annie’s Crochet – not all reading is about books! I mostly crochet squares for washcloths and blankets, and the occasional circle/tube for hats. I haven’t done a lot with shaping (aside from a couple of stuffed elephants and a misguided series of little vegetable-shaped bags). I recently got the urge to make some baby shower presents. So far, I’ve made two pair of one pattern – not terribly difficult, and the booties are so cute! 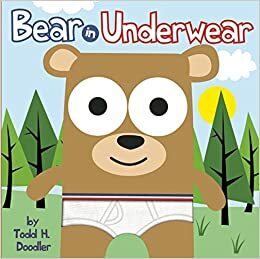 Bear in Underwear, by Todd H. Doodle – I found this book in the LFL a while back. So much fun! Terribly goofy! I took it to work and left it on my desk for a couple of weeks. Some of my co-workers got a big kick out of it. (some not quite as much…) It’s a bit on the long side, but I may have to put together a unit on this for my kids at work. Spinning a Yarn? 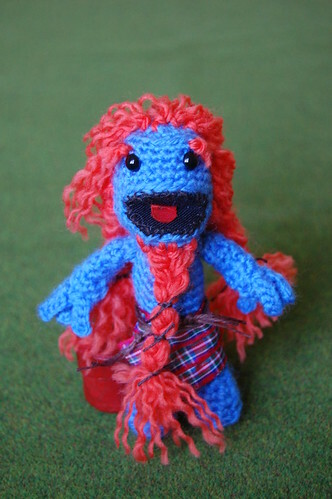 Nope, Crocheting It! 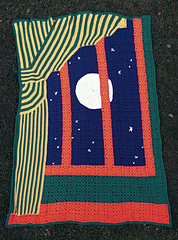 I saw this piece on BookRiot about “Literary Crochet” recently. Amigurumi, the Japanese art of knitting or crocheting stuffed dolls and animals, has been around a while, and of course crocheting blankets and scarves has been around much longer. I’m also pretty sure it’s a law that if you have two or more hobbies or interests, you *must* combine them at some point. 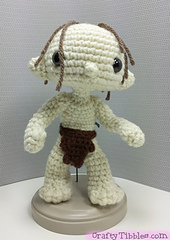 Therefore, it was inevitable that we would see our favorite scenes and characters show up in crochet eventually. 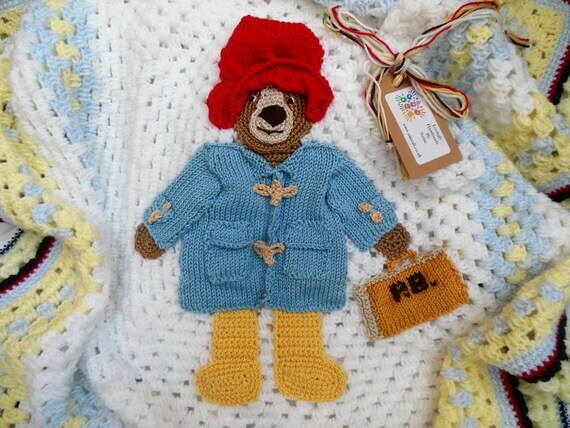 On a recent trip to etsy.com, for Paddington Bear alone, you can find a finished crochet bear, a pattern for a bear and his clothes, and a finished blanket with 3D effect. Paddington not your thing? What about a pattern for Star-Bellied Sneetches, from Dr. Seuss? Have a younger child, or fond memories of board books? 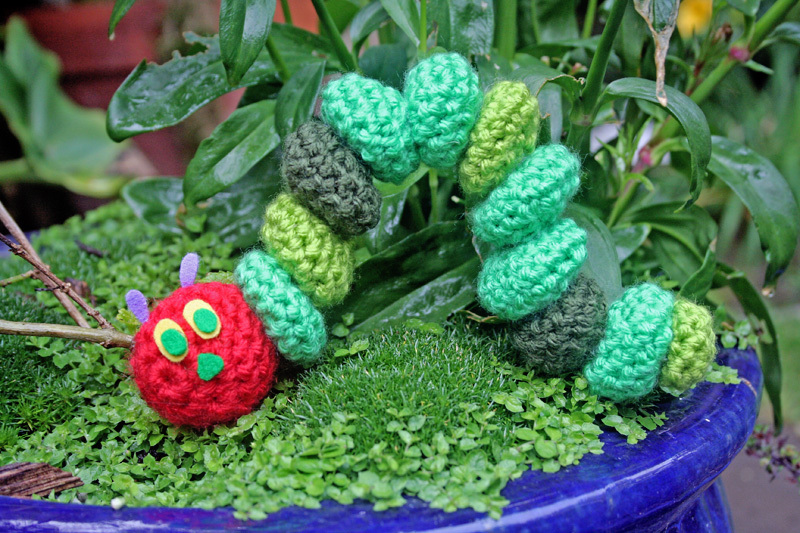 Make your own Very Hungry Caterpillar, to play with or wear! Fond of Young Adult works? How about Rob Anybody from Terry Pratchett’s Discworld series? 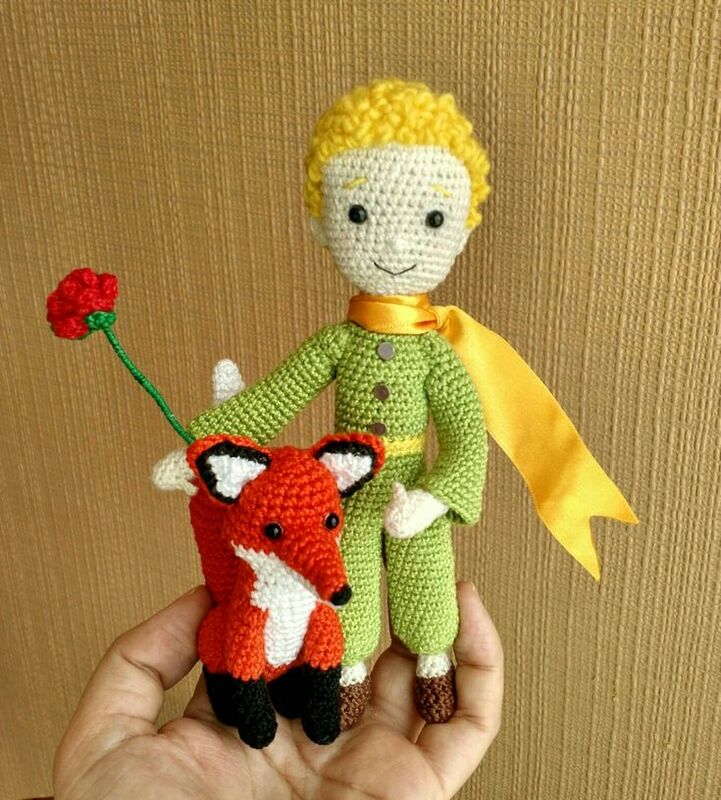 Maybe Le Petit Prince is more your style? 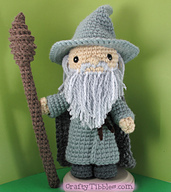 Literary Yarns: Crochet Patterns Inspired By Classic Books, by Cindy Wang — and if you want to see more of Cindy’s work, check out her blog! Make your own Captain Ahab right now! I’d love to see what you decide to make! The Washington State Department of Corrections quietly rolled out a new policy via a memo on their website last month which disallows books to be donated to prisons via nonprofit organizations. So quietly, in fact, that one of the largest nonprofits that works to get donated materials to prisoners was taken by surprise to discover the change. They weren’t informed before it was implemented. “We’re ready to fight it,” said Books to Prisoners, located in Seattle, in a tweet. The new policy limits books to those accepted by the Washington State Library for incarcerated individuals which had already been approved by the Prisons Division, used books from the Monroe City Library directed specifically to the correctional facilities in Snohomoish County, and to those used books purchased by prisoners enrolled in pre-approved correspondence educational courses from the bookstore linked to the educational facility in which they’re enrolled. Individuals have never been allowed to make donations to prisons; those have always had to go through either nonprofits or bookstores. As Books to Prisoners pointed out, this severely limits access to literature for incarcerated individuals, and especially impacts those in facilities outside Monroe County. This highlights exactly why Books to Prisoners and similar nonprofits do the work that they do — these facilities are underfunded and that lack of funding impacts the individuals who use those books to improve themselves and their own literacy. These book donations, which are thoroughly inspected by those at the nonprofit for suitability, fill a critical role in helping those incarcerated who otherwise lack access to vital educational tools. Barring access to literature, which is what this policy does, hinders those who need it most. Other states, including New York, have tried similar bans and they’ve been rescinded. The ACLU has stepped in in similar attempted book bans in prison as well. 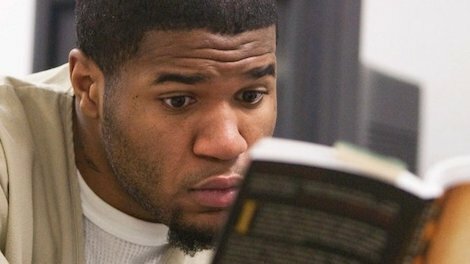 Criminal justice reform includes ensuring that those who are incarcerated have rights to literature and education, so steps like these by the Washington Department of Corrections are but steps backwards. To combat recidivism, literacy is one of the crucial steps forward, and yet, situations like these further hinder rehabilitation and self-development of those who most need it. If you’re in Washington or anywhere in the US, speak up about this policy to help get it changed. Contact Prisons Division Correctional Manager Roy Gonzalez at rgonzalez@docl.wa.gov or by phone at 360-725-8839. Sign the petition set up by Books to Prisoners to stop the ban. Likewise, donate to Books to Prisoners to help support their efforts in getting the policy reversed and keep an eye on their Twitter stream for phone blitzes and other direction action plans you can participate in. Spread the word. Share this and any tweets, petitions, or phone blitz information among your friends, family, and colleagues.